← Hip Hip Hooray for Quick and Simple Solutions! – Stampin’ Up! Yee Haw! A New Photopolymer Stamp Set is Here! Yee-Haw! Dust off those boots, shine up your spurs, and figure out where you left your ten-gallon hat because with the 25-piece Yee-Haw photopolymer stamp set you can really let your cowboy (or girl) flag fly! Recommended clear block sizes are A, B, C, D, & H (not included in the set). Our photopolymer stamps offer a versatile all-clear stamping option. You’ll find that our photopolymer is top-quality and gives a perfectly stamped image every time. The stamps stick amazingly well to our clear blocks and are easy to place just where you want them. And best of all, you get to enjoy tons of images for a great price! Order this set online here. 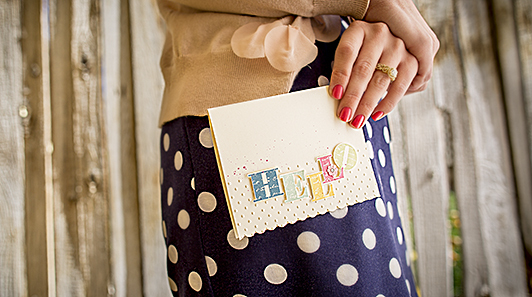 Whether you are a hobbyist or someone interested in building your own business, now is a great time to join Stampin’ Up! For only $99 you will get your choice of $125 worth of product. In addition, during the month of August you can order from the new Holiday catalog before it is available to the public. If you have at least $99 worth of product on your wish list, you really should consider this opportunity. Being a demonstrator has SO MANY awesome benefits and the opportunity has zero risk! If you are interested in learning more please contact me at handcraftingheather@icloud.com or click here fore more information. Full Blendabilities Product Line is Now Available! A while ago I wrote a post about using the “Blendies” if you are interested in reading more about them, you can read that post here. I love these markers! They go on really smoothly and they blend beautifully. To order your very own set, shop in my online store! Buy a Big Shot, Get a Bundle! EXCLUSIVE NEW BIG SHOT BUNDLES HAVE ARRIVED! If you’re anything like me, you absolutely love when BIG opportunities come your way. That’s why we’ve brought you the chance to receive one of five free stamp set/framelit bundles below (your choice!) with purchase of a Big Shot. And if you get a Big Shot now, you’ll be ready for all the new Big Shot accessories in the holiday catalog. If you already own a Big Shot, you can still purchase these discounted bundles at an amazing 15% off! This is one deal you won’t want to miss-only available from August 1-31-as these bundles are one-time only exclusives. Christmas in July (or August)! 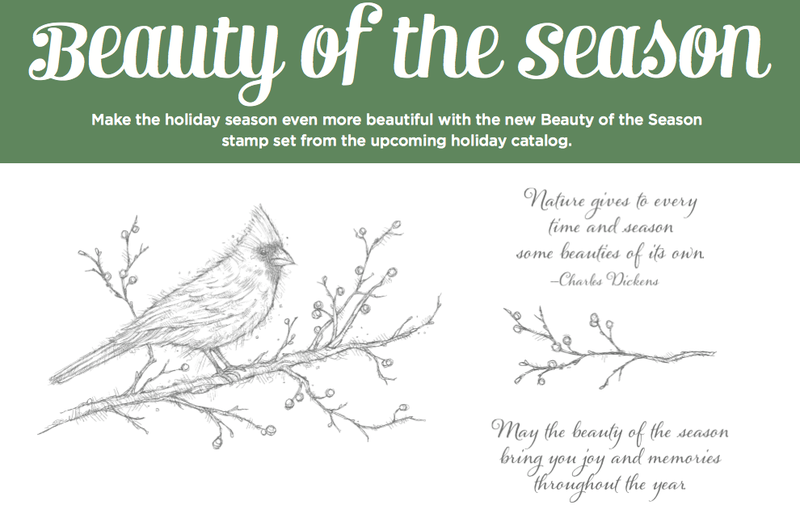 Purchase the Beauty of the Season Stamp Set–now available as a special sneak peek of the 2014 holiday catalog! The new Holiday Catalog will arriving in my customer’s mailboxes very soon! But, you can order this beautiful stamp set in my online store now! Learn more. If you haven’t tried Paper Pumpkin, now is a great time to sign up–get 50% off your first two months. With a deal like this, you’ll want to invite everyone you know to give it a try too! Click here to join. Offer Details: Use the code HALFOFF2 to join Paper Pumpkin before September 10, 2014, and get 50% off the first two months! After that, keep the creativity coming for only $19.95 + tax per month (shipping included). Enter the Promo Code, “HALFOFF2” when you sign up. Click here to see the Weekly Deals from Stampin’ Up! in my online store. The Weekly Deals are only while supplies last and only available at these great prices through August 18.